Hello! 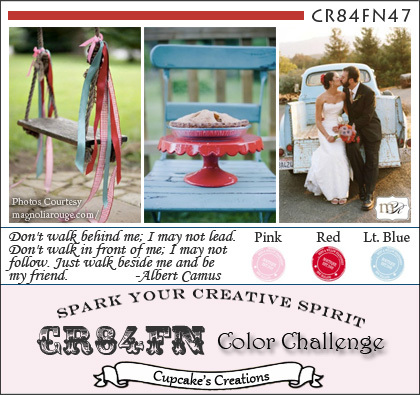 It's week 2 for the current CR84FN Challenge! 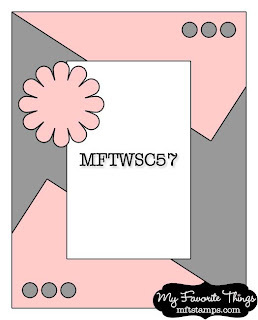 If you haven't played along yet, you have just under a week to play in CR84FN47. Our color palette is Pink, Red and Light Blue. Photos courtesy of Magnolia Rouge. I used MFT's Clearly Sentimental About Romance. For sketch inspiration, I used this week's WSC Getting Sketchy #57 from My Favorite Things. All the challenge details can be found HERE. Accessories: Die-namics First Class Friend, Die-namics Fringed Perennial (My Favorite Things); Peppermint Divine Twine, Brad, Shiny silver pearls (Pizzazz Aplenty), Foam tape, Thread, Sewing machine. Happy Anniversary Stephanie! Your card is so pretty! 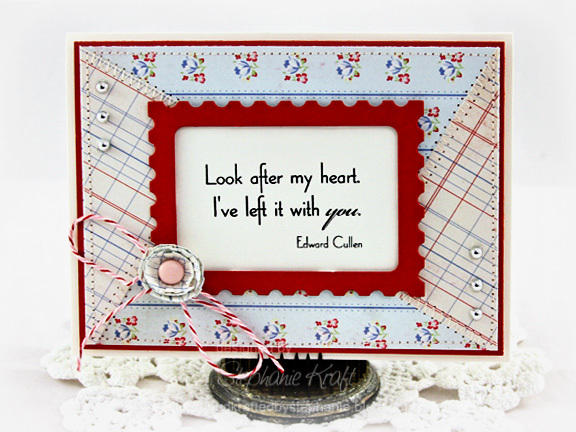 What a great mix of patterned papers and sweet sentiment! Surely Dan will LOVE this! Hope you have a wonderful celebration! What a great sketch, and beautiful papers! Love the stitched panels, and the fabulous sentiment! Beautiful sentiment for an anniversary card. Happy Anniversary! Hope you don't spend it focused on the SB! Love the patchwork feel to your card it makes a lovely card! Happy Anniversary!! Your card is SO PRETTY! Love the sweet floral paper mixed with the ledger paper. Great use of the colors and perfect take on the sketch! Stephanie - this is a super Anniversary card - I love that quote! Great mix of papers and lovely stitched details. Wishing you a very Happy Anniversary! What an AMAZING layout! I love what you've done with the colors - just so inspiring! How pretty! Fab use of the sketch, love the sentiment! Stephanie, what a LOVELY Anniversary card! PERFECTLY romantic sentiment! LOVE your papers and the sketch you followed! Hope you got a great dinner after the Super Bowl! I hope you had an unforgetable Anniversary:) This card is so delicate and the quote is just fabulous!